If you’re a keen cook or budding chef, you’ll know how important it is to take care of your knives, which is where the best knife sharpener comes in. However, if you’re a newbie to the culinary world, you may be wondering why chopping the veg has become such a chore recently. If you’re considering throwing your knives away because they’re blunt as anything, don’t do anything hasty. All they need is a good sharpening. We’ve picked out some of the best knife sharpeners for all types of knives , so whether you fancy yourself the next Gordon Ramsay or you just want to spruce up an old set of silverware, there’s something to suit everyone – and all budgets. If you're on the hunt for a good set of knives, we've got the best in our buyer's guide. WHY BUY A KNIFE SHARPENER? Knife sharpeners are what all the professionals use to keep their primary kitchen tool looking and working its best. They are the reason you get such pleasure from watching cooking shows where the knives glide effortlessly through the ingredients, and they ultimately make cooking a whole lot easier. Which knife type can it sharpen? There is a varied range of products on the market, and you certainly don’t have to go with anything too fancy to get excellent results. Some will be designed for a specific type of knife, whereas others will be versatile and able to sharpen any knife that needs sharpening. Sharpeners are most commonly manual devices, however, If you’re worried about how safe these products are, opt for an electronic sharpener to reduce the risk of cuts and scrapes. This Smart Sharpener by Lantana is an excellent purchase for both high-quality and inexpensive knives. Many users praised this sharpener for its quick results in as little as three strokes, and the 3-step process makes sure all knives are rounded off and polished so that there are no uneven edges. The ergonomic handle makes it easy and comfortable to hold, and allows you to get a sturdy grip on it for easy and safe knife sharpening. This knife sharpener doesn’t work with ceramic knives, but it’s made our top spot for its versatility in sharpening steel knives and even works on serrated knives just as well, which is why its our top pick of the best knife sharpener you can buy. If you’re proud of your knife set, then keep them looking and working their best with this water whetstone that has a rough and a medium side for catering to all sharpening needs. The rough is designed to revert blunt knives back to their former sharp selves, and the medium side is for maintain their sharp blade in between usage. It’s a little expensive, but users find this knife sharpener to produce excellent results on a number of different types of knife, and it makes good practice for those budding chefs out there. This suction-based knife sharpener is designed to make knife sharpening simple and easy for anyone to do in their home. Users like the hands-free design as it doesn’t require much pressure in order to get decent results. However, using this sharpener won’t teach you any proper technique if you’re looking to do it the traditional way. 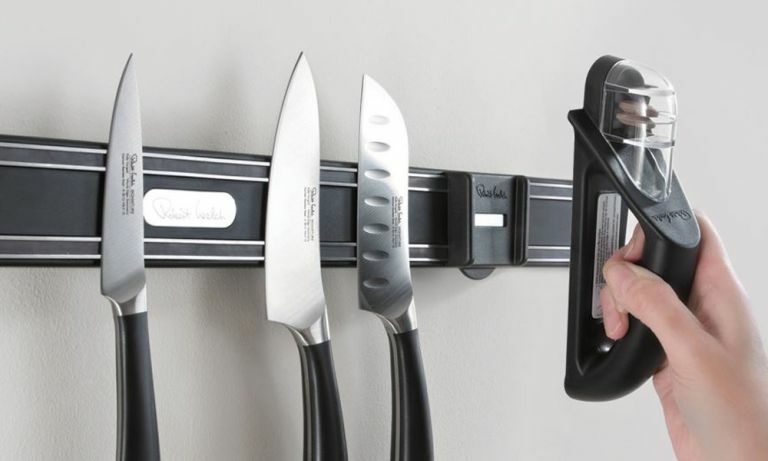 It’s a quick fix for any of your knives that have become blunt, and it’s small enough to store away in a drawer or cupboard. Our pick of the best knife sharpener for those who are concerned about safety. This stainless steel rod is one of the trickiest ways to sharpen knives, but let’s face it, it’s also the coolest way to sharpen your knives. It takes a little bit of practice, but users were very impressed with the results and it comes with instructions to teach you how to correctly sharpen your knives. It works with any and all types of knife which makes it great for all kitchens and will keep your set looking fresh. If you don’t trust yourself with a manual knife sharpener, then this automatic device will get the job done nicely. It’s compact and easy to use with a one-touch function that sharpens your straight edged knives in no time at all. Users like how compact it is and that it requires minimal effort to get excellent results. You don’t need to have a steady hand with this device so it’s much safer and minimises the risk of cuts and scrapes, which is why it's our pick of the best knife sharpener if you're looking for something electronic. For use on serrated knives, bread knives, hunting knives and kitchen knives, this compact knife sharpener is the kitchen gadget you never knew you needed. To use, simply place on any smooth, hard surface, and twist to ensure it can't move. Insert your knife and begin sharpening using easy, light strokes. In terms of storage, it can easily fit in your cutlery draw, or you can stick it to your tiles so it's on-hand for whenever you need it. The best knife sharpener if you're after something compact, we think.